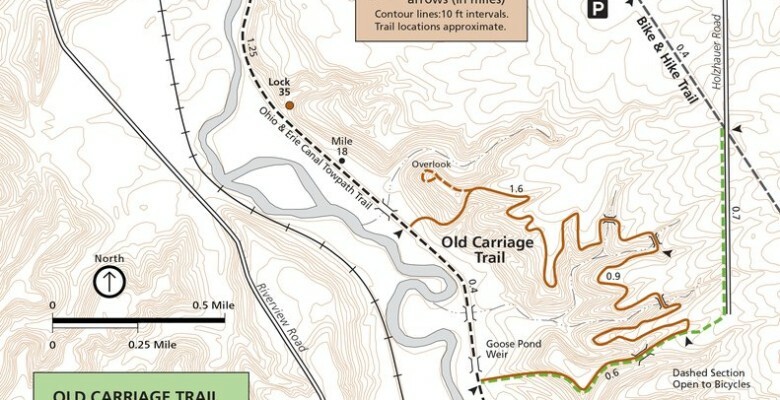 Brecksville, Ohio – The National Park Service has awarded a $1,320,500 contract to complete restoration of the Old Carriage Trail in Cuyahoga Valley National Park (CVNP). Contractors are removing some trees and demolishing deteriorating bridges. A re-routing of the trail and bridge replacement will be completed later in 2018. For public safety, The Old Carriage Trail will be closed throughout the project and the Old Carriage Connector Trail will be closed during construction hours, 7:00 a.m. – 6:00 p.m. Monday to Friday. Visitors can access the Ohio & Erie Canal Towpath Trail from the connector trail after hours and on weekends. We ask trail users and nearby residents to respect these closures to ensure a speedy and successful re-opening of the full trail. PPW Builders, Inc. of Cleveland was awarded the contract. PPW Builders is also the prime contractor on another project ongoing in CVNP, replacing four bridges along the Ohio & Erie Canal Towpath Trail. Funding for the Old Carriage Trail project comes from entrance fees collected at national parks through the Federal Lands Recreation Enhancement Act. This funding is helping CVNP to complete a long-standing deferred maintenance project that would not have otherwise been possible. Old Carriage Trail is a 3.5 mile loop that is accessed from the Ohio & Erie Canal Towpath Trail, between Red Lock and Station Road Trailhead in Sagamore Hills. The three 150-160 foot pedestrian bridges have been closed since 2009, due to safety issues from unexpectedly rapid deterioration. The first step in the process will be tree removal in order to accommodate a re-routing of the trail and access for construction vehicles. The park is working closely with Greenwood Village Community Association in Sagamore Hills to create a new route for the trail that will only involve replacement of one out of the three failing bridges, which significantly reduces the cost of getting this trail open for the public. “We know that people have been waiting for years for this trail to re-open completely. This would not be possible without the cooperation and assistance of the Greenwood Village Community Association. We appreciate their partnership on this project” said Craig Kenkel, Superintendent of CVNP. Visitors can expect to see and hear activity very soon, as the contractor has nearly completed marking trees for removal. Care is being taken to remove as few trees as possible, and especially to protect large canopy trees. Bridge demolition is expected to take place in the spring. Work is highly weather-dependent, so a precise timeline is unknown. Replacing the Twin Oaks bridge and rerouting of the trail is expected later in 2018. The re-route will eliminate the need for the Hemlock and Rocky Run bridges.